Actress Kim Sun Ah couldn’t concealed her beauty even when wearing mask as seen from the photo she uploaded that has attracted attention. On the afternoon of December 22nd, 2011, Kim Sun Ah wrote on her me2day account, “The first day of promotion for Scent of a Woman. Managed to escape temporarily alone. Originally was taking a cab, but suddenly found that it’s too expensive. After riding for 3 minutes and 45 seconds, I alighted to transfer to subway. Short duration of leisure. How long has I not been taking subway? 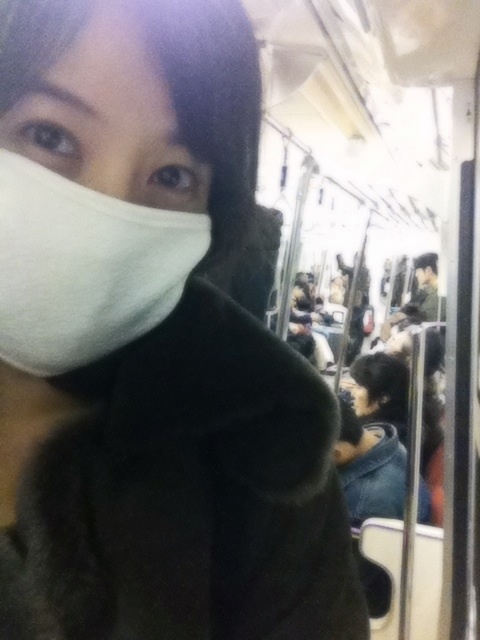 The self-portrait taking in the subway is very exciting,” and uploaded a photo. In the photo, Kim Sun Ah was wearing a white mask, almost covering the whole face. But her bright eyes still shining and unable to hide her beauty. After seeing the photos, netizens said, “Very difficult to challenge subway in Korea, eventually achieved it in Japan,” “How come more and more good-looking,” “The mask cannot cover the beauty,” and so on. Kim Sun Ah was at Japan to promote the drama series Scent of a Woman, and held a fan meet on December 20th, 2011.